milly and tilly: I'm knitting again, even though it's 100 degrees outside! I'm knitting again, even though it's 100 degrees outside! Earlier this year I visited Scotland and was lucky enough to get up to the Shetland Islands! (I saw Shetland ponies, puffins, and so many sheep!) While in Lerwick, we popped into the Shetland Museum and picked up this year's free knitting pattern for Shetland Wool Week. Unfortunately I will not be able to go back to Shetland for Wool Week (it's September 23rd through October 1st this year), but I will be knitting the hat from the free pattern with some lovely yarn I bought in Shetland! 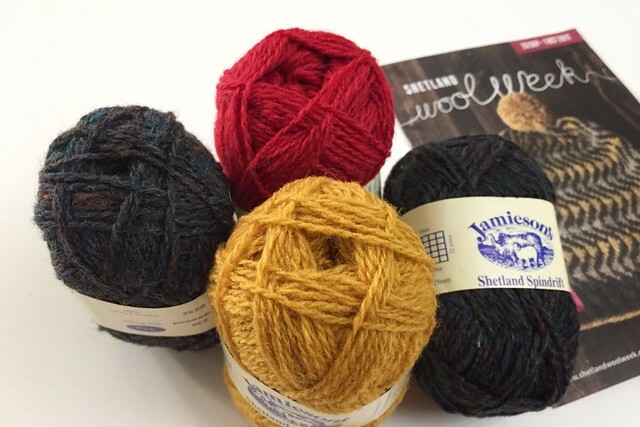 When I was planning the trip to Scotland I knew I wanted to buy some yarn (and a spurtle) so when we happened across Jameson's of Shetland I was unexpectedly overwhelmed because I didn't know what to pick or how much to buy. Then I remembered the hat pattern I had picked up earlier and realized I had to knit the Shetland Wool Week hat with Shetland wool! The Jamieson's shop in Lerwick had so many color options; it was hard to pick only three when there was a wall full of choices. I was immediately drawn to rosewood then finally decided on mustard and crimson to go with it. Now that I'm looking at the yarn again I'm not sure how well they go together, but we will see how the hat knits up. I can't wait to see the hat.